“I was walking around the dorm one night and I could hear somebody crying in the dorm,” he said. He quickly found the boy from Southern California alone in his room. “So, of course, the next night, he and his sister were both at our house for hamburgers,” Mr. Crider smiled. Mr. Crider is a former mathematics teacher, dorm staff, long-term Mussoorie resident, and environmental activist. Walking to his house, I passed by his single-seat electric car and garbage truck, which was used for his organization’s plastic trash cleanups. As I entered his house, I was greeted by piles of books, papers, and writings that swamped all the tables. With his laptop screen open and phone positioned on his ear, Mr. Crider was talking to a local student about mathematics. Although he no longer formally taught, he was tutoring other kids from the hillside at his own home. Mr. Crider has had a gigantic impact on the school and the wider Mussoorie community — literally and figuratively. Just by entering his room, one feels encapsulated by his booming, reverberating voice and large frame. 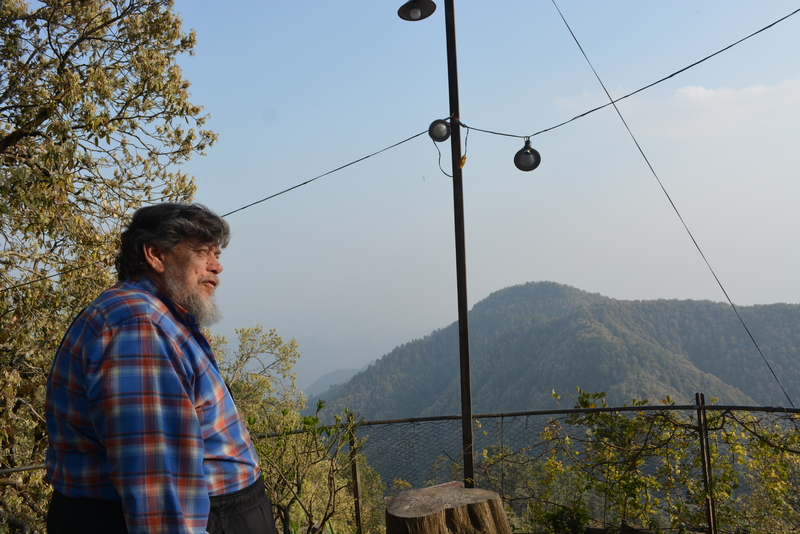 Moreover, Mr. Crider has lived on the hillside longer than most residents in Mussoorie. Mr. Crider first heard about the school from the friends of his wife, Judy Crider, a Woodstock alumna. What they told him made him feel the need to take action, but he never knew that he would end up staying in Mussoorie for 40 years. Shortly after taking a trip there at the end of Sept. 1979, both Mr. and Mrs. Crider applied for jobs in residential work at the school. They were given the jobs and soon after they arrived, their daughter was born in Mussoorie. “In a lot of ways, we say that this is where life has happened,” he said, reminiscing. Back then, life for Mr. Crider consisted of the following routine: he would get up at 4:30 am every morning to help carry the cows, get the milk, and feed them. Then, he would take a quick bath and, if he “got on time,” get breakfast. He would then go to school, come back home, and repeat the farm chores. All in all, his work hours lasted from 4:30 am to 7 pm. “Having a mixed variety of students to work with was good for me,” he said, highlighting the diverse, cross-cultural experience one experiences at Woodstock. Hence, it comes as no surprise, that when he came to Woodstock, Mr. Crider dived into dorm work for the next nine years, submerging himself in the “privilege of building relationships with teenagers.” More importantly, to “model parenting” for children whose parents are far away. One night, Mr. Crider recounted, there was a disturbance going on in the dorm. This was with the Class of 2000, one of whom was Mr. Jonny Seefeldt, who would eventually become a head of upper years. “It turned out that a bunch of boys was sneaking out the dorm on a full moon night and they had a movie camera or two. They all dressed up for a wedding party and one of them was in a white gown to be the bride. They were gonna sneak out to Flaghill to have a wedding,” he said. As Mr. Crider crept softly behind the boys. Even with his “big size,” they “never recognized that [he] was even there.” Hence, the boys went out and around the back of the Hostel up to the place where there is currently a locked gate. He recounted a night when they noticed a boy standing still alone in the Hostel dining room. “He simply just stood there and stared at my face,” he said. One of the main ways that Mr. Crider feels that life can be made “real” is through an increasing connection with the outdoors. However, this did not stop him from venturing into the wild. After the injury, he took a group of middle school children and walked back the school gate to Thatyur, Suvakholi, Nag Tibba, Lurnzhu, the Aglar Source, and finally back, making a huge circle of 90 kilometers, all on foot. “I don’t think any middle school group has done that since. Not many before either,” Mr. Crider said. Perhaps it is because of this deeply-rooted connection with nature that led Mr. Crider to become a foundational force in the plastic cleanup organization, KEEN (Keeping the Environment Ecologically Neutral). Furthermore, he would routinely visit khuds bombarded with trash. “The way trash is treated so often in India is, if you throw it down the gully and walk on, it’s not yours anymore,” Mr. Crider added. Hence, as an initiative to clean up Mussoorie, Mr. Wechter hired three young men (one of which was the current operations manager, Ashok Kumar) to visit these gullies and collect trash. When Mr. Wechter left Woodstock, he asked Mr. Crider to take up the organization. “Now, we’re at 2019 and Ashok Kumar is still working with me on this recycling program,” Mr. Crider said. One of the biggest accomplishments of KEEN would be its efficient segregation system when it partnered with Woodstock and the hillside homes. During that time, according to Mr. Crider, they managed to separate the waste so distinctively that they could take the dry waste and recycle 90 percent of what they had picked up. This, according to Mr. Crider, is the biggest environmental problem that Mussoorie faces today: “Many, many people do not see the value of segregating waste. Many do not want to pay to solve the problem of environmental concerns. “‘No one does,’ he replies. It is through fighting this dogma that Mr. Crider has learned a valuable trait: perseverance. When he had started working for the Nagarpalika, the Mussoorie government, KEEN worked “without a contract for a whole year” and thus, Mr. Crider had to put a lot of his own funds into the initiative. “Now that we kept at it, Nagar Palika has agreed that it’s worthwhile, we’re able to get some of my money back. The new officers of Mussoorie, like Anuj Gupta, are supportive of us: right now, we’re doing wards 1-9. He would like us to be doing wards 1-13,” he said. The workers will hopefully be earning a combined 640,000 rupees a month, commissioned by the Nagarpalika, for doing this work. Slowly, his hard work is bearing fruition. The government is recognizing the importance of cleaning the streets and khuds. If Mr. Crider had given up, it would be very likely that Mussoorie would be filled with trash. Filled with monkeys scavenging empty Coke bottles. Filled with paths of empty tobacco packets. In other words, without Mr. Crider, Mussoorie would have literally become a mountain of trash, especially with the massive tourist population. Secondly, you must “value your relationships with each other and with adults around you.” “Woodstock itself builds relationships. You’re gonna remember some of your teachers and dorm parents uniquely because of Woodstock. Finally, Mr. Crider stresses students to “dream big.” According to him, students “in many, many ways can be whatever they want to be.” Mr. Crider mentions the “crazy school song we sing,” Shadows, in this reflection: “Aim at the higher goals! Currently, Mr. Crider lives with his wife, Mrs. Crider, at their house atop Pennington. He tutors students in mathematics. He is the chairman of KEEN and is also greatly involved at Union Church. “I don’t usually get bored. I can keep busy enough,” he said. However, what may be the biggest accomplishment of all is his connection with the rest of Mussoorie. “Whether it’s because of my size or because of the length of my living in Mussoorie or whatever, everyone in Mussoorie knows Dana Crider,” he said. Don't get enough email? Receive our updates!